Kitchen La Bohème: How did your culinary career begin? Jill Gusman: From a very young age I have been passionate about the environment and how we take care of it. Eating natural foods, organically grown and low on the food chain seemed to just make sense to me. Thankfully my mother was patient with me as a teenager wanting to eat differently. That was really the beginning of the journey. KLB: When did you first start teaching at the Natural Gourmet Institute and what was it about the Institute that drew you in? JG: It was in 1994 that I started teaching at the Institute. I went there because my background personally and professionally with food was with natural foods and the relationship of food and health. The Institute and I seemed to be a perfect match. The school’s philosophy was similar to my approach to health and wellness. I thought how great it would be to teach in a program that prepares students to working professionally with the highest quality natural foods. KLB: Are you vegetarian or vegan in your personal life? Do you have any particular reasons for choosing to be or not to be? JG: At this point I no longer feel a need to declare one point of view for eating. Having said that, I will say that over many years I have tried numerous different approaches to eating — for sentimental reasons, political, philosophical, spiritual & scientific ideas. For me, one way isn't necessarily better than another. I feel it's important to make choices for where you're at, health wise. Sometimes we eat from too much of a conceptual idea about food, forgetting how the food affects us everyday. There is an inherent wisdom our bodies have. If we can develop that, trust that and follow through on that, our food selection may look very different than how we "thought" about it. KLB: Many make the choice to become vegan purely because of ethics. In this case it seems that a lot of the dietary focus is on mimicking the taste and texture of meat and dairy products using plant-based ingredients, especially soy. What are your thoughts on this? JG: If you declare vegan from that point of view, and are desiring/craving imitation meat and dairy, I challenge you consider the quality of those "imitation" products. The over-reliance on soy, especially in non-fermented forms, can be potentially more harmful than eating certified humane, organic animal and dairy products. That may be a big hurdle for some people to consider, but if you want to be vegan/vegetarian you ought to really study food to learn about creating true health. I have seen many students over the years be very committed to an ideology about food at the expense of their own health. Be open to your body's changing needs. Not all "natural" foods are so healthfully made. The natural food industry is a huge profit-making business. Many so-called natural foods sold as such are not healthful at all! Know your products. KLB: What is the best and healthiest way for vegans to include soy in their diet? JG: There is no exact one way to do this, since the context each person eats soy is unique. No one eats the same way, even in the same household! Generally though, the best way to eat soy products is as traditional cultures have eaten them: unfermented sometimes, but in a mineral rich diet. An example of this is the traditional miso soup — a soup made with a bonito, kombu, miso broth, a tiny amount of tofu, wakame seaweed and scallion garnish. In miso soup, the tofu is minimal and eaten with minerals. Fermented soy has been eaten in larger quantities throughout time: Miso, tempeh, tamari, shoyu and natto. Small amounts of tofu and soymilk (usually made fresh) & edamame are also good. These soy products were not eaten to replace animal or dairy exclusively, the way modern people do. They did not make tofu dogs, tofu cheeses, soy ice cream, soy yogurts, soy chips, soy candy bars or soy pills for menopause! KLB: Can you give advice to vegans who may be overusing tofu and soy products as egg/dairy replacements, for eating healthy, balanced meals and still getting wonderful results minus added soy? JG: Why not include other vegan proteins more often and keep tofu for the occasional quick protein? Eating like this does require some planning though. For example, beans need to be soaked and cooked. Learn how to cook tempeh and seitan so they are yummy. Remember nuts and seeds too! Get to know flax seeds for replacing eggs in any recipe; they are so much healthier and delicious, too. 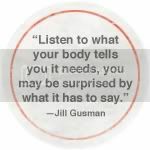 And listen to what your body tells you it needs, you may be surprised by what it has to say. 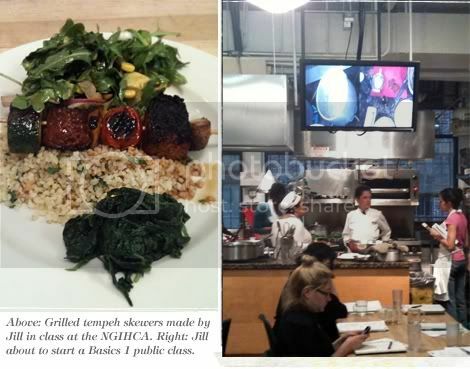 Jill Gusman, author of Vegetables from the Sea, is a veteran chef instructor at the NGIHCA. She brings over 20 years experience, commitment and passion to teaching about natural foods and health. Jill is also a food writer, lecturer, private chef and avid gardener. 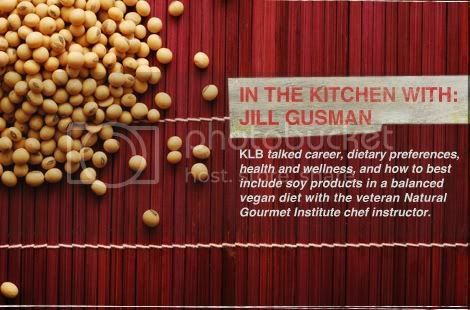 A graduate of the Kushi Institute, Jill combines macrobiotic philosophy and Ayurvedic knowledge into everyday cooking. She has appeared on Discovery Health, NPR, and was interviewed by Gary Null. Most recently she created "Kids in the Kitchen" for Kidzone TV at Mt. Sinai Hospital. Jill loves the great outdoors, is a wild food enthusiast, and has worked closely with Lyme disease and all its challenges. For consultations outside of the NGIHCA, Jill can be reached by email at JillGB@aol.com or via phone at 917 459-9492.